Life, DLG style: Look what I can do! 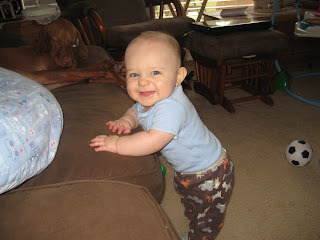 Just when I was getting used to the idea of Jon David crawling all over the house, he decided to make things more interesting. 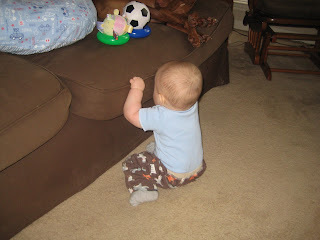 He crawled over to a "walking" toy that was stopped against a chair and pulled himself up to play with it. I didn't even have time to take a picture with my phone when he sat back down. 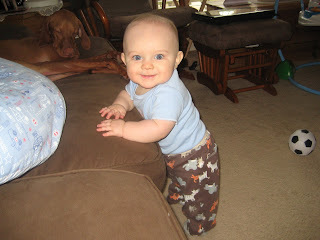 Lucky for me, he continued to pull himself up on the couch all afternoon and I was able to get some pictures. I think Shelby being on the couch was his motivation to get up! 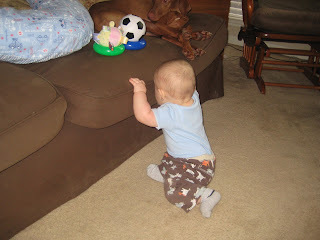 He sure loves that dog!